Chris Moore was born in Eugene in 1956 on the same day his mother graduated from the University of Oregon. Although he left town and graduated from the University of Chicago in 1978 with a Bachelor’s degree in politics, economics, rhetoric in law; he returned to Eugene where he attended the University of Oregon law school. While a third-year student, he began working for the law firm of Malagon, Velure & Yates writing appellate briefs at the Workers Compensation Board and Court of Appeals and for disabled Oregonians before U.S. District Court on Social Security Disability cases. 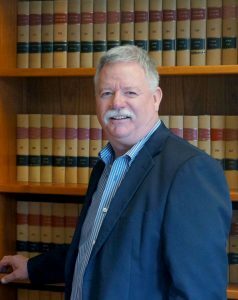 In 1982, he graduated from the University of Oregon School of Law with a Juris Doctorate and began working as an associate for Malagon and Associates. In 1986, Chris was made a partner in that law firm and in 2009, became managing partner of Moore & Jensen. Chris has tried thousands of cases before the Workers Compensation Board’s Hearings Division and its administrative law judges, and he has represented workers on appeal at the Workers Compensation Board, the Court of Appeals, and the Oregon Supreme Court. Chris has also represented a great many disabled Oregonians before the Social Security Administration on the social security disability and supplemental security income cases. Chris has been lobbying for the interests of injured workers before Oregon’s legislature and the Management Labor Advisory Committee since 1985. Chris has been a member of the American Trial Lawyers Association (now American Association of Justice) since 1983 and a member of the Oregon Trial Lawyers Association since 1983. He has been a member of the Oregon Workers Compensation Attorneys since 1982. Chris has devoted a significant amount of time to these various organizations being a member of the Oregon Trial Lawyer’s Board of Directors and is a past president of that organization. He has been a chair of the Oregon Workers Compensation Attorneys as well as executive director of the same organization. He received the Douglas W. Daughtry Award of Merit from the Oregon State Bar’s Workers’ Compensation System in May of 2006. In August of 2006, Chris received the Douglas Swanson Outstanding Workers’ Compensation Attorney Award from the Oregon Trial Lawyers’ Association. Chris has also been a member of the Best Lawyers in America since 1999 and Best Attorneys in Oregon since 2012. He was accepted into the National Registry of Who’s Who beginning in 2000. Over the years, Chris has frequently spoken on Workers Compensation matters to a number of groups including the Oregon Worker Compensation Attorneys, Oregon Trial Lawyer’s Association, the Oregon State Bar, Oregon Law Institute, the American Bar Association and the Washington State Trial Lawyers’ Association. Chris and his wife, Barb, have lived in Eugene since 1979, where they have successfully raised two children into two wonderful adults. Both have graduated from college, and one received his MBA from Duke University. They are both working on the East Coast. Chris’s hobbies include cooking, wine tasting, camping, playing with his over-active Labrador retriever and enjoying peace and quiet in the house now that the kids have moved out.